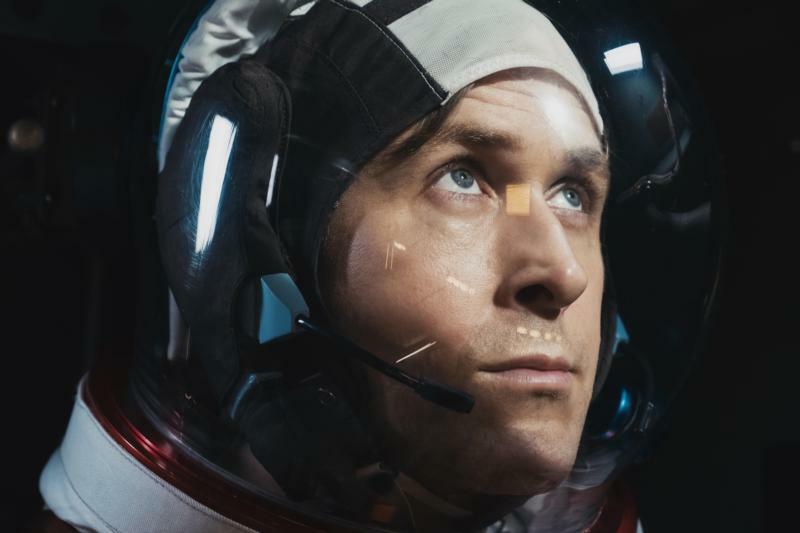 NEW YORK (CNS) — By turns the intimate portrait of its elusive subject’s inner life and a lavish look back at the sometimes tragic, ultimately triumphant race to the Moon, “First Man” (Universal), director Damien Chazelle’s multidimensional profile of astronaut Neil Armstrong (1930-2012), is a splendid piece of moviemaking. Though it includes language that would normally restrict its appropriate audience to grown-ups, the film’s artistic merit and educational value make it possibly acceptable for mature teens. Parents will have to weigh the elements listed below against the lesson in recent history Chazelle’s adaptation of James R. Hansen’s 2005 official biography entertainingly imparts. Following Karen’s death — his feelings about which he initially shares with no one — Armstrong and his strong-willed wife, Janet (Claire Foy), need a fresh start. So he applies to participate in NASA’s Project Gemini, becomes one of the first two civilians chosen as astronauts, and the family relocates from California to Houston. Janet also is courageous enough to make Armstrong, who loves playing and roughhousing with his surviving children, do the hard work of preparing their two boys for the possibility that he might not return from his lunar journey. Onscreen, at least, their relationship is well balanced and their home, overall, a happy one. Yet Armstrong is haunted not only by Karen’s fate but by the wrenching loss of colleagues who fall prey to the dangers of their work. Despite the universally known outcome of the story — as commander of Apollo 11, Armstrong became the first human being to walk on the Moon on July 21, 1969 — Chazelle and screenwriter Josh Singer successfully infuse their account with suspense. They do so by reminding viewers of the radical problems NASA had to overcome and the perils Armstrong and his fellow rocket men constantly had to face. Subtle performances, sometimes jarring special effects that effectively convey both the discomfort and the terrors of space travel and cinematography that captures, among other things, the eerie otherworldliness of the lunar surface add up to a memorable, if sometimes leisurely paced, two hours plus. That’s a long flight, but in the end, this eagle lands flawlessly. The film contains brief scatological material, a few profanities and milder oaths, as well as a single rough and a handful of crude terms. The Catholic News Service classification is A-III — adults. The Motion Picture Association of America rating is PG-13 — parents strongly cautioned. Some material may be inappropriate for children under 13.